Submitted by Hayle Harbour A... on Mon, 06/11/2017 - 17:12. Not long until our Christmas Market on South Quay! We have 30 stalls full of wonderful gifts and crafts, some incredible food and of course a brilliant bar! 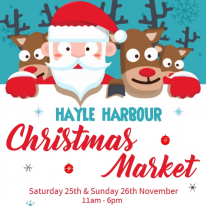 Come and join us between 11am and 6pm on Saturday 25th and Sunday 26th November :) ?? ?? ?? ?? ?? ? ?